Elision is a term in epic poetry relating to the dactylic hexameter. In Latin, it means "knocking out", and is characterized by the practice of omitting certain syllables during scansion. A final syllable ending in a vowel (or the letter -m) is normally elided before a word beginning with a vowel (or an h-). 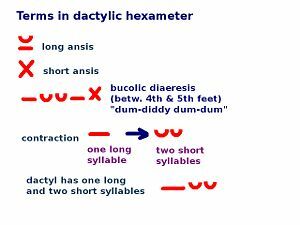 Dactylic hexameter is also known as "heroic hexameter" is a form of meter in poetry or a rhythmic scheme. It is traditionally associated with classical epic poetry in both Greek and Latin and was considered to be the Grand Style of classical poetry. It is used in Homer's Iliad and Odyssey and Virgil's Aeneid. This page was last modified 10:13, 31 March 2010.